Genuine 6mm Swarovski crystal beads in Birthstone colors were used to create this beautiful birthstone Rosary. 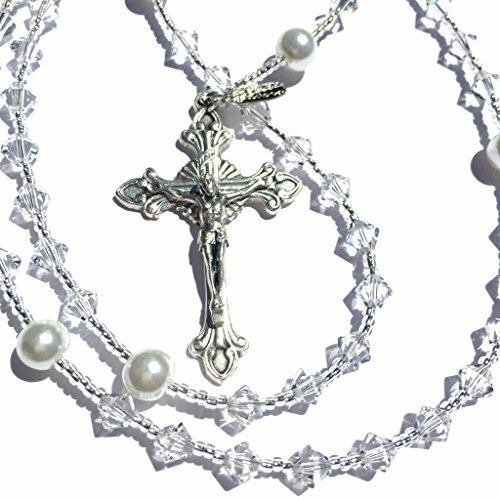 8mm white glass pearls, along with glass silver seed beads were also used in this gorgeous Rosary and accented with a detailed silver Miraculous Medal centerpiece and detailed crucifix, direct from Italy. Each piece is designed and carefully handcrafted in the USA. Authentic Rana Jabero piece. Tag included with each piece along with a beautiful ribbon gift box, ready for gift giving! Genuine 6mm bicone shaped Swarovski crystal beads in were used to create this beautiful Rosary, along with white glass pearls in 8mm size and tiny glass seed beads in between. Authentic Rana Jabero piece. Tag included with each item along with a beautiful ribbon gift box, ready for gift giving! Due to different monitor resolution settings, the colors may slightly vary from photo and the actual item. If you have any questions about this product by Rana Jabero, contact us by completing and submitting the form below. If you are looking for a specif part number, please include it with your message.